Lizards, with their prehistoric appearance, beady little eyes, and often quirky behavior, hold great appeal for both adults and children. Unfortunately, most people are unable to identify more than a few. The Desert Museum took notice and produced this visually focused pocket guide. 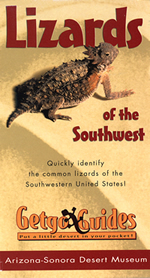 It not only allows you to quickly identify the Southwest?s most commonly seen lizards but it also contains dozens of fascinating facts about their lives (such as a species that consists entirely of females and another that actually has a voice!). Lizards of the Southwest makes identification a snap: find your lizard, match it up with one of the photographs in the guide and you have it! You?ll learn about each species? distinguishing marks, where each lizard is most likely to be found, and how to differentiate males from females. Also included are little known, fascinating facts about these much-loved reptiles.